Climbing forest Garderen (Netherlands), for young and old! Climbing forest Garderen, for young and old! Are you enjoying a lovely holiday in the Netherlands, in the middle of the Veluwe? And are you looking for a fun day-activity? 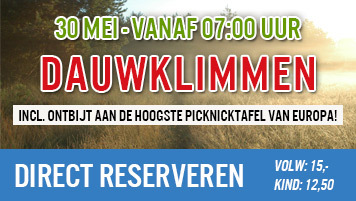 Come and climb the safest and highest climbing forest in the Netherlands! A unique securing system makes sure that you are continuously secure which makes this the safest climbing forest in the Netherlands. There are as much as 9 different tracks to be discovered. And in one of them you can cycle in the trees at an altitude of 25 metres! 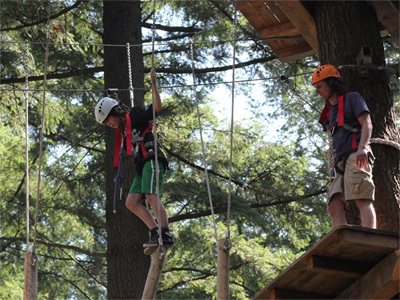 Climbing in the climbing forest is fun for all ages – children who are at least 1,20 metres tall are already allowed to climb. But it’s also big fun for dads, mums and even grandpas and grandmas! Children will love it if dad also goes sleighing or zipping down in the trees, right? For €19.75 per person everyone can come climbing for 2.5 hours. A special rate of € 14.75 per child applies to children under the age of 12. 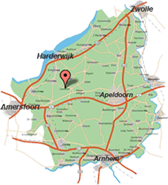 The climbing forest is centrally located between Apeldoorn and Amersfoort and free parking spaces are available. Want to know which days are free? Click on the red button for direct online reservation and get a 5% discount! Because we feel it’s important that you can read all the information in your native language, we have put Google Translate to work. Choose the desired language above and you’ll be fully informed. We look forward to seeing you in Garderen climbing forest!